Over the next year or so, the City of Keizer is embarking on a revitalization study including large portions of River Road North and Cherry Avenue Northeast. That means if residents and business owners want to have a say on what becomes of Keizer’s “Main Street,” it’s time to get involved. While the parameters of the study are still somewhat loosely defined, the specific areas included are likely to be from Weeks Drive to River Road North on Cherry Avenue Northeast; Weeks Drive to Greenwood Drive on River Road North; Linda Avenue to Rose Park Lane on River Road North; and Lockhaven Drive to McNary Estates Drive North on River Road North. Keizer Senior Planner Shane Witham said the study is an attempt to update and bring into alignment previous development plans covering those areas. “It might be a single plan for all three areas or a different plan for each one, but I’m expecting that we will end up with a package of text that changes how we implement regulations in the identified areas,” Witham said. Depending on how residents want the areas developed, it might mean substantial changes to how new developments are constructed – with residences on top of commercial spaces – to aesthetic changes like a wider palette of color options or increased attention to landscaping. One key aspect of the study will be how the changes tie into the area’s transportation systems. The study is being funded through an Oregon Transportation and Growth Management (TGM) grant. While Witham and Community Development Director Nate Brown are just beginning a series of weekly meetings with Portland-based Otak consultants to come up with specific dates, two groups need to be assembled. One is a group of about 10 Keizer stakeholders who will advise on the overall scope of the study, the second is a handful of community members who will form a Community Advisory Committee and review the output of the study and make the final recommendation to the Keizer City Council to accept it. In addition to those, group time is being set aside for public meeting to gather additional input, but the dates are not yet certain. For those who are shy about speaking in public, other outlets are being planned as well. “We also expect that we will be rolling out a project website to solicit comment,” Witham said. Given a city budget that is silo-ed and spoken for long before it ever reaches the dais of the city council, Witham is also hoping the visioning process includes talk about funding. “I’m hoping there will be a candid conversation about how the needle gets moved financially and we discuss the tools and implementation strategies that are possible,” Witham said. 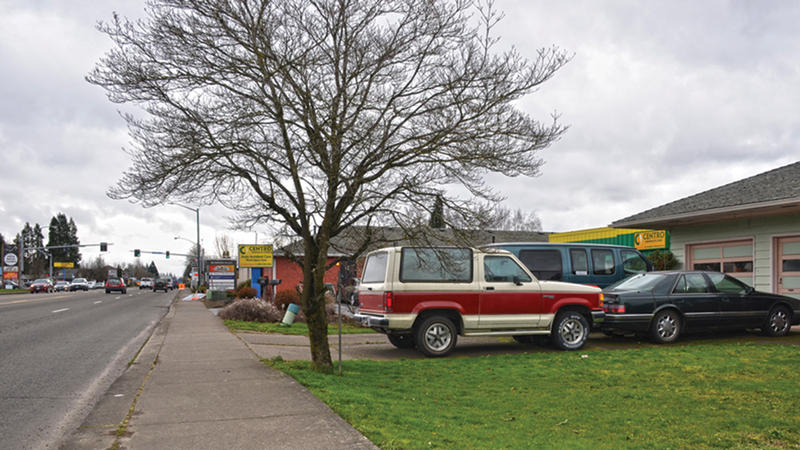 The last substantial funding Keizer had available for economic development came from an urban renewal district that has since been disbanded. Still, the idea of creating a vision for River Road is hardly new. “There is a lot of work that has gone into River Road over the past 20 years and it took a lot to get it to this point, against a lot of opposition in some ways,” Brown said. The last major effort took place just after the turn of the millennium. It was known as River Road Renaissance and while the project made some strides in revitalizing River Road, the few lasting impacts were incorporating ideas like meandering sidewalks and stamped sidewalks across driveways into the development code. Other ideas like creating defined districts along River Road struggled to get off the ground and didn’t stick after The Great Recession gutted the urban renewal budget. Brown stressed that while the substance of the conversation will deal with the sometimes dull language of Keizer’s development code, the changes made will come from communal vision.